In the years since Vladimir Ashkenazy first came to prominence on the world stage in the 1955 Chopin Competition in Warsaw, he has built an extraordinary career, not only as one of the most renowned and revered pianists of our times, but as an artist whose creative life encompasses a vast range of activities and continues to offer inspiration to music-lovers across the world. Conducting has formed the largest part of his activities for the past 20 years. Formerly Chief Conductor of the Deutsches Symphonie-Orchester Berlin (1989-1999) and the Czech Philharmonic (1998–2003), and Music Director of NHK Symphony Orchestra in Tokyo (2004–2007), he assumed the new position of Principal Conductor and Artistic Advisor to the Sydney Symphony Orchestra in January 2009. Ashkenazy maintains strong links with a number of other major orchestras with whom he has built special relationships over the years, including the Philharmonia Orchestra, Cleveland Orchestra, San Francisco Symphony and Deutsches Symphonie Orchester Berlin. 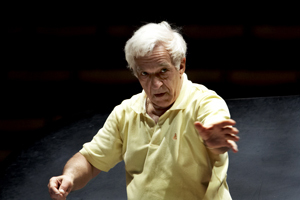 Vladimir Ashkenazy is featured on several Ondine releases; he has recorded Dvořák’s Symphony No. 9 "From the New World” (ODE 962-2D) and works by Richard Strauss with the Czech Philharmonic (ODE 976-2; ODE 943-2), as well as Bruckner’s Symphony in F minor with the DSO Berlin (ODE 920-2). Recordings with the Helsinki Philharmonic Orchestra include Josef Suk's Asrael Symphony (ODE 1132-5) and Rautavaara’s Third Piano Concerto “Gift of Dreams”, commissioned by Ashkenazy as a concerto which he could conduct from the piano (ODE 950-2).